Just when you thought Charleston couldn’t possibly support another small plates, European-inspired bar, along comes Babas on Cannon. With its high ceilings, full-length picture window, and white marble everywhere, elements of the airy space certainly look like they came from the Wine Bars “R” Us catalog. However, the similarities stop there, as Babas is indeed a sui generis offering unto itself. First, there’s the (at least when I visit) all-male staff, uniformly knowledgeable, welcoming and well-coiffed to the degree of being a bit indistinguishable. “Did we tell our order to that guy … Or the guy that looks just like him?” Next there’s the nighttime menu itself, replete with so many novel terms you might experience the same school age anxiety associated with a pop quiz. It’s not just the food that’s unfamiliar, as the wine is also distinctive, with options ranging from the uncommon (German and Austrian varietals) to the unpronounceable (the Spanish Inaki Etxeberria, “Bengoetxe”). Grab a seat, and you’re soon presented with a complimentary bowl of green olives and another filled with salty potato chips, thereby getting the dehydration — and no doubt the craving for a carefully curated adult beverage — off to a rollicking start. Roughly half the menu is prepped in advance. 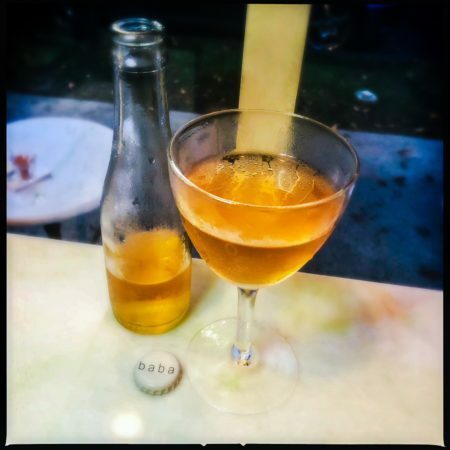 A standout sampled from the ‘aperitivo case,’ the mushroom conserva ($7) is small, but mighty. Go with someone you love, or in whom you possess a high level of confidence in their hand-washing regimen, as the accompanying chunk of bread does not break easily. On that note, should you opt to deliver them directly to your mouth via toothpick, the tiny, oil-infused straw and enokitake fungi are at once rich and light. The smoked sprats ($12) were hailed by the dapper, well-informed waiter as “the best bang for your buck.” Served with another firm section of uncut baguette, as well as labneh with ‘verde,’ the small, headless, tail-on fish were described as being like anchovies, but the flavor is more akin to smoked sardines. Served in the can, every third one is a bit fishy and there’s not really enough bread to go around. “Verde,” it seems, is a mix of fresh dill, capers, and olive oil. Stridently herbal, it overpowers the fish, which may be preferable depending upon your palate. 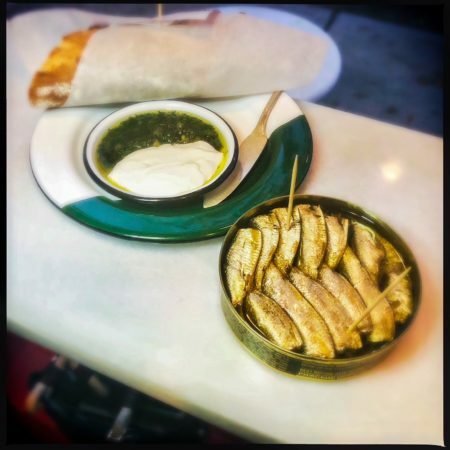 “It’s so weird that you call those fish,” commented my dining companion after trying one. Be that as it may, the waiter was right about the value proposition, as there are a lot of them crowded into the circular tin. The premade snacks are rounded out with a few other baguette options (with olive oil [$4] or butter and Burgundy truffles [$18]), as well as some cheese and charcuterie selections ($8 each). 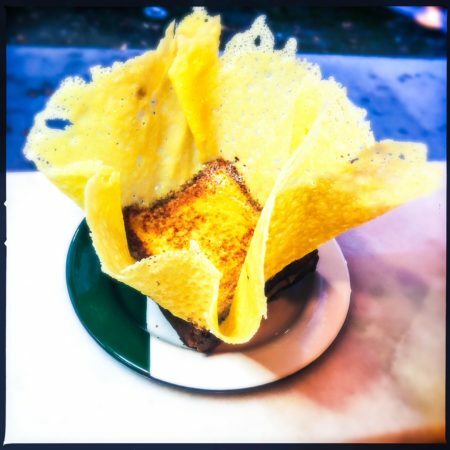 Case in point, the brioche grilled cheese ($10) with the addition of frico ($4), is a spectacle. What arrives is akin to a Chihuly work made of Parmesan flamboyantly affixed to the top of the decadent sandwich. Decidedly confounding from a consumption point of view, the best approach seems to be to break the oily cheese cracker off and set it on the edges of the plate. 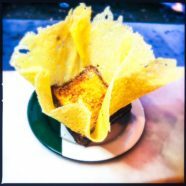 The sweet and savory sandwich itself is extremely buttery — if you have any rings you’ve been hoping to remove, they’ll likely slide right off — I quickly tore through a tall pile of small cocktail napkins sitting on the bar. 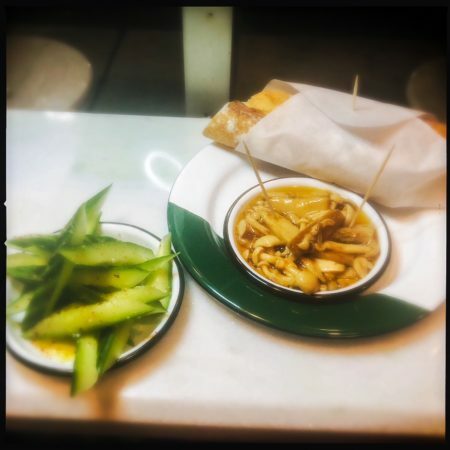 In contrast, the cucumber crudité ($4) is just that, a stack of cucumber spears. Well-seasoned with lime, salt, and spicy Aleppo pepper, it’s light and fresh … and perhaps not best accompanied by a glass of the German Von Winning Sauvignon Blanc ($13). Granted, the sommelier acknowledged this accusation with an amused laugh, noting sake would make for a much better pairing. 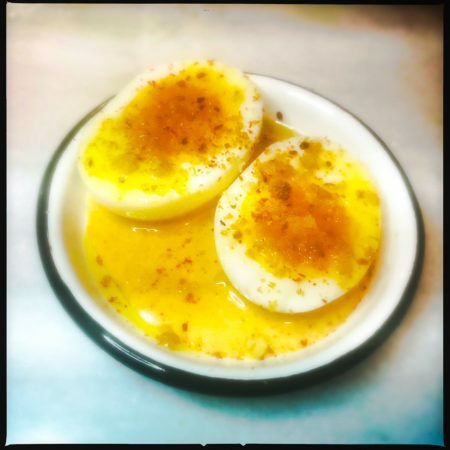 In other news, the deviled egg ($1.50) arrives at best deconstructed, the two not-quite-hardboiled halves basking in a pool of smoked paprika-flavored aioli. Topped with chunky salt crystals, olive oil, and more smoked paprika, it’s fine, but certainly not memorable. 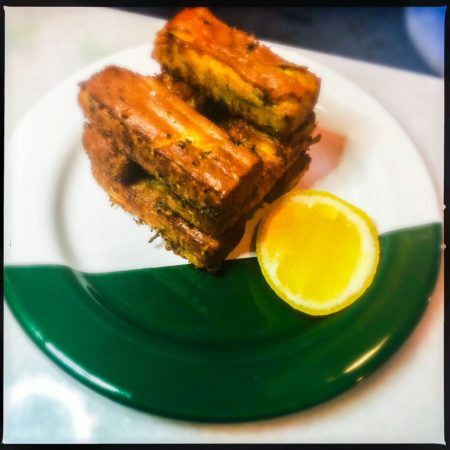 The fried chickpea panisse ($8), served with a wedge of lemon, was an unexpected delight. Comparable to mozzarella sticks filled with warm hummus, they’re crisp, silky, and absolutely delicious. I’m not telling you how what to do, but if you don’t order some, you’re not living your best life. Confounding, quirky, and charming, Babas on Cannon is at once familiar and peculiar. However, this is the good news, as the small, stylish establishment has seemingly achieved the near-impossible, creating a unique destination worth seeking out in an already crowded cafe scene.